Homeowners said they could time it while sitting on their porches. There’d be a snap. Maybe another quick crack. Wait about 30 seconds. Then it started again. Support Our U.S. Disaster Relief EffortsThe eerie creaking of the ice testing the strength of trees echoed for miles. Often, the ice won and many limbs toppled into the streets. The broken branches impacted power lines, causing many homes to be without electricity even more than a week after the winter storm that hit Augusta, Georgia, on Feb. 12. “Certain areas kind of look more like the path of a tornado than the path of an ice storm,” said Rudy Barrington, a volunteer team leader from Waycross, Georgia, working with Samaritan’s Purse to help homeowners affected by the terrible weather. VOLUNTEERS NEEDED: Sign up to help people in Georgia. HELPING AFTER A WINTER STORM: Samaritan’s Purse is helping people in Georgia affected by devastating winter weather. 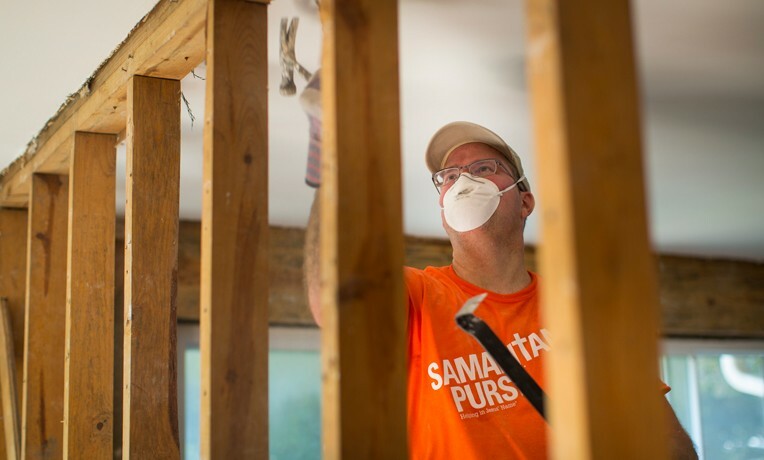 Samaritan’s Purse responded to the storm that crippled parts of the South by sending a Disaster Relief Unit to Augusta and staff and equipment to Moncks Corner, South Carolina. Volunteers in both locations are cutting and removing damaged and downed trees and clearing debris. When we arrived, ice still coated trees, power lines, and roads. As the ice melted and our volunteers began to remove fallen debris and even trees that posed potential risks, the same creaking that had caused so much fear before took on a different sound. In fact, the second 61-year-old Saundra Walker heard the cracking now a week later, she threw her hands into the air and sang. It was definitely a different tune for the retired Augusta resident who endured the ice storm alone and went five days without power, a hot meal, and even a shower. Saundra needed help on her own property, but she volunteered with us while she waited for her own home to be worked on. Her singing of the Halleluiah chorus every time our volunteers helped down a broken tree caught on so much that other teams sang it too, even when she wasn’t there. As volunteers went out into the community of Augusta, it quickly became evident that the ice wasn’t the main disaster in these people’s lives. People suffered from recent suicides of loved ones. Widows and divorcees struggled with being alone. Many were hurting and at the end of their ropes. This ice storm just put an added strain on an already stressed community, just like the limbs that were cracking under the pressure of the ice. 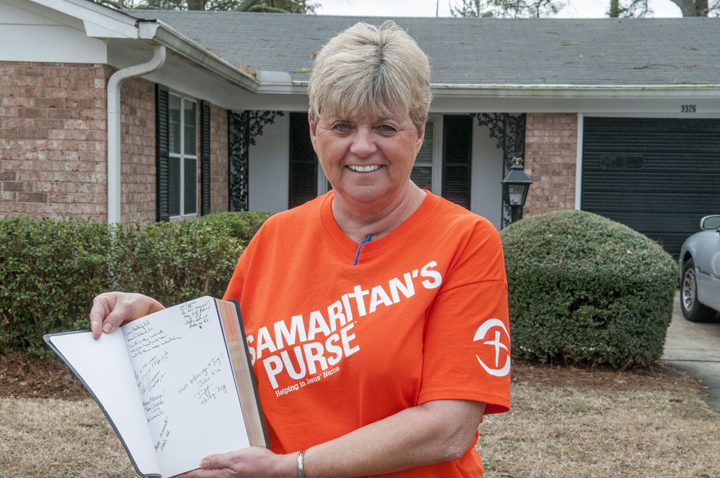 The spiritual support she received from Samaritan’s Purse—including a Bible signed by all the volunteers who worked on her property—made a difference in Saundra’s life. Saundra had her own personal storm to deal with. She felt like a failure after her divorce and had no family to speak of, living and feeling completely alone. Even so, she volunteered with us for days despite her own yard’s damage. Our team decided to surprise her by cleaning her yard and removing fallen trees when she was out working to help her neighbors. When Saundra pulled up in her driveway at the end of the day to a clean yard, she threw her hands to her mouth in shock. And when she received the Bible signed by the volunteers, she couldn’t contain her tears. Saundra is continuing to serve with Samaritan’s Purse. She said she found being a local volunteer was not only a blessing to her, but also helped foster relationships with neighbors who were otherwise skeptical of the free help, and like her, feeling alone.